Oppdag en av Italias vakreste strøk av kysten på denne Amalfikysten dagstur fra Roma. Besøk den pittoreske byen Positano og utforske vulkanske ruinene av det gamle Pompeii, et UNESCOs verdensarvliste. Kombiner italiensk natur, arkeologi og historie på denne intime, liten gruppe tur begrenset til syv / åtte personer per kjøretøy. Din Amalfikysten tur starter når du reiser Roma med minivan for stasjonen sør inn i Campania-regionen i Sør-Italia. Dette er en liten gruppe tur med maksimalt syv / åtte personer per minivan, som sikrer en personlig opplevelse. I løpet av den omtrentlige 3-timers reisen vil føreren din fortelle deg hva du kan forvente fra dagen. På dagstur til Pompeii kan du nyte en 2-timers guidet tur på sine verdensarvsliste ruiner som var dekket av vulkansk aske fra utbruddet av Mt Vesuvius i 79 e.Kr. Når du utforsker med guiden din, kan du lære om oppdagelsen av ruinene i det 18. århundre og høre historier om livet i landsbyen under det gamle Roma. Din neste destinasjon er en autentisk familiedrevet oljemølle som produserer sin egen olivenolje og hvor du kan smake den i kysthagen med en fantastisk utsikt over Napoli-golfen! Du vil også nyte en lett lunsj bestående av pasta med ferske tomater saus eller andre hjemmelagde sesongens grønnsaker, Caprese Salat (Mozzarella ost og lokalt produserte tomater) vann og til slutt limoncello (andre drikkevarer er ikke inkludert). Om ettermiddagen vil vi tilbringe litt tid på å utforske Positano, hvor du kan nyte en spasertur rundt den herlige landsbyen med sine hvite og pastellfarvede hus som kaster opp åssiden. Du kan besøke de vakre strendene, hvor du kan slappe av eller svømme, spasere rundt den gamle fiskehavnen og se den fantastiske majolica-kuppelen i kirken Santa Maria Assunta. Din dagstur slutter med stasjonen tilbake til Roma. Very good tour and guide but guide talked a little too much during the drive to and from 6 hours!. Pompeii stop was excellent as was the separate guide. Lunch stop included was great in between Positano and Pompeii. In general, the tour was awesome! The day, we've waited outside our hotel for 30 mins the pick up time was from 6:45-7:15. However, we didn't know we were being picked up last and was kind of scared that we got left behind. Luckily, there was an emergency phone no. not the normal office phone no, and only till then we knew we were picked up last. So if anything happens for your during the pickup, be sure to call the emergency phone no. I'm glad I joined this semi-private tour, instead of the ones where there's lots of people. There was a total of 8 of us, plus the driver/tour guide George. So we were on a mini-van, which later turned out to become a blessing as there were many twists and turns in the roads of Almalfi Coast, being in a mini-van like ours makes it safer and more efficient to drive on the road. Our driver/tour guide was George. He's a very good driver, keeping us safe and sound, and driving with a comfortable speed. However, I've learnt nothing about Italy from him. He barely talked to us or introduced places. We felt that he doesn't like his job. He seems like he doesnt want to be there. He can keep to his driving though. At Pompeii, we met with another tour guide named Hector. He was great and was one of the highlights of the trip. I learnt so much about Pompeii and he was quite funny and introduced us to interesting spots. He told us stories of what happened during those times. It was a very enjoyable tour at Pompeii. This day trip allowed us to cover a ton of ground that would not have been possible if we rented a car ourselves. Our driver George forgive me, not sure if I am spelling his name correctly, was outstanding - very professional and a gentleman. He arrived on time and drove responsibly that is a challenge in the traffic of Rome and all of the scooters! to our destination. The first stop in Pasitano was as picturesque as could be - the coastline and town are nestled up a steep hill loaded with stores and restaurants. The next stop was at a family owned Olive farm, where the service, staff, food and wine made a perfect lunch overlooking the island of Capri!! The next stop was Pompeii and getting straight to the tour was great no lines and an outstanding guide to lead the way. Pompeii was awe inspiring and so much to take in, but our guide was keen on offering up information in abundant quantities. I greatly appreciate the professionalism of the Pompeii guides and the respect that they have for the ancient ruins as they are quick to tell imposing groups and individuals to make space for their tour. The trip home was just as smooth as the trip in and concluded a day that covered so much ground and history - worth the money : If you are staying in Rome and want to have an awesome experience, this tour is most definitely for you! We were able to participate in the Positano Pompeii tour while visiting Rome. It was a great experience with the exception of the Pompeii portion. Our driver Ruperto was an absolute delight. He was very knowledgeable and pleasant while driving us to our destinations taking time to identify a few points of interest and facts as we passed them by. Positano was lovely and very scenic. We thoroughly enjoyed walking around the town and getting to see the beach. The restaurant we were taken to The Patriarce was AMAZING quaint and With a strong sense of Italian Flavors. You will not try better olive oil and lemoncello than here. Unfortunately our tour of Pompeii did not go as well. Our tour guide Cayetano was rude arrogant and condescending. There were older people and our group who at times struggled with the many steps and uphill climbs. He felt it appropriate to tell them they were wasting his time and a burden on the rest of the group as invalids. Which they were not. On more than one occasion he told our group we were not allowed to speak while on the tour. Completely ruined the experience for us and many in our group. It is unfortunate as the rest of the day was wonderful. This tour was AMAZING! One of the best tours I've booked with Viator. Some reviews I read complained about the driver's English being hard to understand, but I did not have any trouble at all understanding him. He does have a thick Italian accent, but you're in Italy so everyone has an accent. It was a long drive about 2.5 hours in the car, but we did make time for bathroom/ coffee breaks. The scenic overlooks were amazing. The first stop for us was the Amalfi Coast, where we had about 5 mins to stop and take photos. Our driver, Rocco, was kind enough to offer to take photos of us. Next, we went to Positano where we had 90 mins of free time to shop/ relax/ take photos. Then we had an amazing lunch at a family owned restaurant where everything was made fresh. The restaurant had amazing views of the coast, and it was included in the cost. Finally, we had a guided tour of Pompeii. My recommendations are to bring comfy shoes, lots of water, and sunscreen. I had a great time on this trip, and even though the ride was long we got to see so many beautiful sights along the way. I would also like to thank Rocco for pointing/ explaining what things were to us along the way. He was telling us the history of Rome/ the other places we visited. First of all, understand that this is a 13 hour day from when you are picked up at your hotel until you are dropped of and that most of that time is driving. We were prepared for that in general but were highly disappointed that in all that drive time Rome - Amalfi Coast, Amalfi to Positano, Positano to Pompeii, and then back to Rome our driver spent perhaps 25 minutes telling us about Italy and the sights we were seeing. The rest of the time, he spent on his cell phone or just weaving in and around traffic. On our trip, we went from Rome directly to the Amalfi Coast about 3 hours and sat in traffic for 45 minutes or so and then finally got to Positano where we had about 60 minutes to walk around. We then went to the private vineyard for lunch decent food but note that the glass of wine they offered is not free - you have to pay for it. Then it was another hour or so to Pompeii - we got there at maybe 2 PM. By this time we were all wondering what we paid for. Well, Pompeii was worth it. The 2 hour or so tour was guided by a professor that definitely has a passion for Pompeii and the knowledge behind that passion. I would highly recommend that portion of the tour to anyone. After Pompeii it was a 'fast and furious' trip back to Rome sometimes hitting and sustaining 170 kmh or about 106 mph between traffic slow-downs to make up for the time lost during the day. Honestly, I would recommend that travelers pay the extra amount for the tours that take the train from Rome to Naples and then you are picked up by tour guides and taken to Pompeii and then delivered back to the train station after the Pompeii tour. 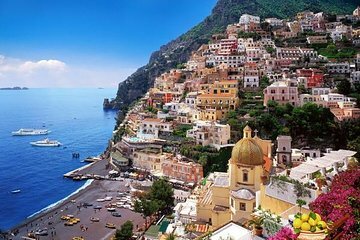 I only wish that we had more time in Positano and the beautiful Amalfi coast. What a beauty this was. The restaurant that we had lunch was phenomenal too. The staff were so gracious on this family run farm overlooking the beautiful coast. The pasta dish and salad were some of the best food I have ever had. My only suggestion would be to make the Positano visit a bit longer than the 1.5 hours that we were given. Our tour driver was so warm and friendly. He made everyone of us feel special. Thank you so much! We had a blast on this tour! Everything went as planned, and yes it was a long day, but we expected it would be long. Our driver was great he was knowledgeable and funny. The drive was gorgeous, and while we only had a short time in Positano it was really fun exploring the city during our allotted time. Lunch was delicious and the day was capped off with Pompeii. Stopping here last was terrific, it was later in the day and that made the 2 hour tour less hot. The guide in Pompeii was great, very passionate about the history. We would definitely recommend this tour. What a great tour! Diver was very friendly and informative providing lots of history during the drive. Amalfi Coast was breath takenly beautiful. Positano was very busy with lots of shops. Beach was pebbles and extremely busy. Our tour guide in Pompeii was fantastic. Having a tour guide is an absolute must! He stopped and explained everything we were seeing. There was so many small details that you would miss without the expertise of the guide. Well done!!! !